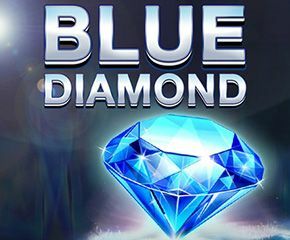 Blue Diamond is a slot designed by Red Tiger Gaming that features 3 reels and 1 payline. Some players may expect this slot to be a shiny slot filled up with gemstones. The slot is a recreation of the classic fruit slot that has some excitement added to it due to respin feature. Read this review to know more about this online slot. The slot has stakes varying from 20p up to £500 for every spin. It can be seen that the reels have a sheen of a high definition. The bright and beautiful cherries can be seen on the plain white coloured reels that are actually the symbols having the low value. Landing cherries on the reels can award you some big wins. You can play this online slot on all devices including mobile desktop and tablets. The triple, double and single bars on landing will award you an awesome payout of 8x your total bet. These bars can be landed in any combination and in slots of 3 to form winning combinations. You will be paid up to 18x for three single bars, up to 28x for three double bars and lastly up to 38x for a set of triple bars. The red sevens are also quite lucrative as they will pay you a prize as big as 88 times the stake for landing them on the middle reel. The blue coloured diamond is the wild symbol of the slot that can replace all the symbols. If a wild symbol lands on a single payline, it will get frozen in its place and also a respin will be awarded. On landing one wild, it will also get frozen followed by another re-spin. Landing all three blue diamonds on the reel present in middle will fetch you a re-spin or a single spin. 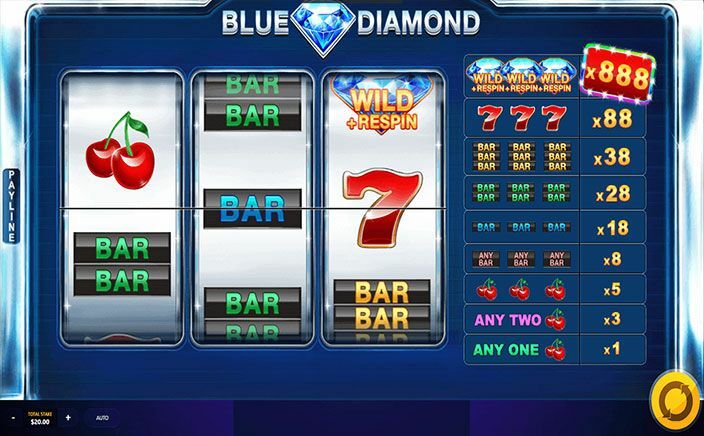 Blue Diamond slot has a simple look, but the visuals are crisp as well as clear possessing high definition. The soundtrack added in the background sounds very fine. The action included is very fast paced and the variance is medium. The wilds will keep coming frequently thereby fetching you some decent wins. The respin feature is a hypnotic one and will surely pay you some pretty good wins. Overall, with a return to player percentage of 96.17%, Blue Diamond must be tried for sure.